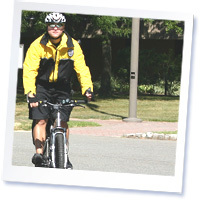 The Security office at the West Windsor Campus is open 24 hours a day, seven days a week, and is committed to providing a safe campus environment. The Security Department is also responsible for protecting college property and the enforcement of all college regulations, including parking and traffic control. The James Kerney Campus Security office provides the same services and is open during the normal operating hours of that facility. Red telephones are located at either end of hallways and vestibules throughout the campus. These telephones provide direct communication with the Security office and should be used for emergency reasons only. Campus crime statistics are available upon request. The College is host to many organizations and community activities throughout the year. Visitors who do not have an appointment with a specific campus official should first report to the Security Office. Visitors who are guests of current students are the responsibility of the host student and will be expected to abide by policies and procedures set forth for all students. Visitors/guests will not be permitted to enter classrooms where instruction is being provided without prior approval by the classroom instructor. Student parking at the West Windsor Campus is available in the East and West parking lots I and II. Unless given advance authorization and permit by the Security office, use of all other parking areas is prohibited. Parking along curbs, fire zones, and loading/unloading areas is prohibited. Limited free parking is provided for students at the James Kerney Campus. Several parking garages are available in the immediate area. Campus parking violation tickets carry fines which must be paid within ten (10) days at the Bursar's office. Ticket appeals must be made within ten (10) days to the Director of College Safety & Security, located in the Library Building. Unpaid fines or repeated violations may result in a financial hold being placed on your student records, the suspension of privileges and/or disciplinary action imposed by the Student Conduct and Discipline Committee. Mercer County Community College has a vital interest in maintaining a healthy and safe smoke-free environment for its students, faculty, staff, and visitors. Smoking on campus grounds is prohibited. All members of the college community, including all individuals and groups using college space and facilities, are accountable for compliance. This policy is further detailed -- including penalties for violations -- in the college's OMB #695 as well as in the MCCC Student Handbook. No pets, with the exception of service dogs, are permitted on campus grounds or in campus buildings. If pets are required for a classroom assignment or a planned part of an authorized campus activity, the owner must have secured previous approval from the classroom instructor or the Director of Student Activities. Contact Security, ext. 3503. A lost and found unit is located at Security. You should check there if you lose any items or belongings. Unclaimed items are discarded at the end of each semester.